Tonight I had the pleasure of attending Ailey II’s spring preview at the Ailey Citigroup Theater. The program showcased excerpts from In & Out, Something Tangible, I am the Road, and a full length performance of Gêmeos. Artistic Director, Troy Powell, set the tone for the evening with his heartfelt words about the roots of Ailey II and the journey of its dancers through community outreach. The entire twelve person company provided a spirited mix of modern dance that engaged through fresh choreography, street style inspired costumes, and at times, pulsating sound. In & Out, choreographed by Jean Emile, and Something Tangible, choreographed by Ray Mercer, harnessed the spirit of Ulysses Dove’s, Episodes, and made it their own with fierce and sensual spurts of pure athletic movement. Gêmeos, choreographed by Jamar Roberts and performed by Courney Celeste Spears and Jacoby Pruitt lent itself to playful competition chock full of highly controlled muscular strength and grace. My favorite of the four featured dances was I am the Road, choreographed by Kyle “JustSole” Clark. This excerpt danced to hip-hop beats and delivered in colorful fare complemented by classic PUMAs was an ode to the Company’s camaraderie and showcased a penchant for fun. Notable performances were made by Deidre Rogan, whose ballet training stood out amongst the pack in In & Out and continued to inspire awe throughout the evening. Others that shown brightly were Courtney Celeste Spears and Jacoby Pruitt, who both impressed in Gêmeos; but for Spears the full reach of her talent came out in I am the Road. Lloyd A. Boyd III also stood out as one to watch during this number. It is hard to believe that this group consists of professionals in training. I enjoyed this show in spades over their highly regarded counterparts at the Alvin Ailey American Dance Theater Company. I was won over by the high octane energy flow, formations, and transitions that sewed together perfectly with a thread of rhythmic accompaniment. Tickets are currently on sale online at alvinailey.org/aileyiinyc or by phone through Ovation Tix at 866.811.4111. Tickets can also be purchased in person at the Joan Weill Center for Dance at 405 W. 55th Street. Tickets for groups of 10 or more are available through group sales at groupsales@alvinailey.org or by calling 212.405.9082. For full schedule of events, click here. 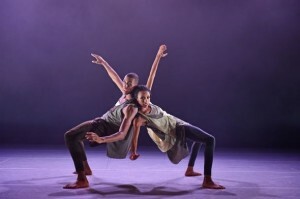 This entry was posted in dance and tagged ailey II, alvin ailey, dance, new york.